Home :: 3) American Cichlid water cond. 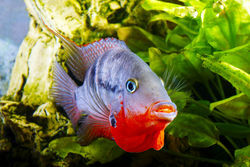 Water quality and water conditioning is essential for the health and wellbeing of all aquarium fish. Large American Cichlids are a hardy and tough fish and will often survive for long periods of time in poor water conditions. But even this tough Cichlid will become a victim to these conditions eventually. Poor water quality leads to stress and stress leads to disease and disease is much harder to treat in poor water quality, so often the fish will succumb to the disease and slowly die. Generally aquariums with American Cichlid are more heavily stocked than say a tropical aquarium with smaller fish, the tropical aquarium may have many more fish but the total body weight of the Cichlid tank is generally greater. The total body weight of the fish is the primary indicator for the amount of water changes required. The bigger the fish the more food, the more food, the more waste and the higher the nitrate levels. 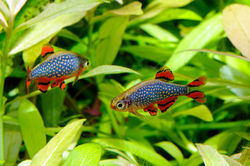 In most cases a weekly partial water change is required.